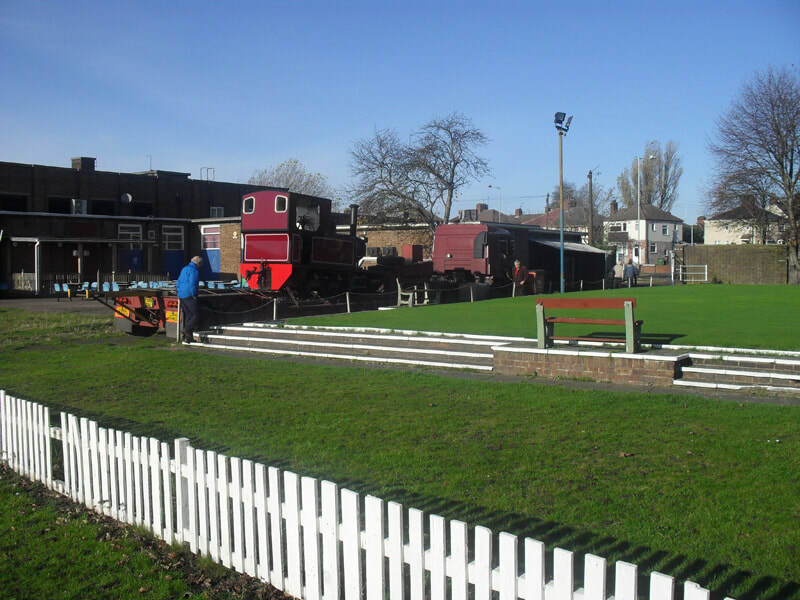 From the start of the 2019 season, Gertrude will be moving to the Leighton Buzzard Railway, where it will be based. The locomotive has now spent most of her 10-year boiler ticket working on the Welsh Highland Heritage Railway. Originally built to work on an industrial railway in the heart of England, it is fitting that she is now coming to Leighton Buzzard, and joining sister locomotive 'Doll'. ​Since the start of restoration, the locomotive has been managed by Exmoor Transport. As Exmoor Transport's role is now complete, the company has now been wound up. The locomotive continues to be owned by the Westmacotts, and everyone involved looks forward to a new chapter ahead in the locomotive's history. Gertrude and The Doll have been reunited again this last week and working together on the WHHR in Porthmadog. The works plates went on Gerty on the Saturday of the ‘Elements’ event, and they look very nice. We are unsure if she has worn any works plates since possibly as early as 1949 (pictures in S&L are often in shadow to the rear of the loco, and rarely does the left-hand side get seen). Perhaps the only picture with a works plate is the official view, although The Doll did have hers (at least one of them) quite late on. As part of the anniversary of The Oakwood Press, Gertrude carried their name board on the front of the train for one of the runs. As part of the Warley Model Railway Club’s NATIONAL MODEL RAILWAY EXHIBITION hundreds of visitors stepped onto the footplate of Gertrude, while a historic display of her life, and of where she worked in industry – the Alfred Hickman ironstone quarry at Sydenham, near Adderbury, and the Stewarts & Lloyds steelworks at Bilston – could also be viewed, along with photographs and video of Gertrude’s preservation activities with Exmoor Transport. Les Driver, Andy Richards, Shaun Robins and Jim Pounds, the leading lights of the November 2006 to August 2009 big-push to complete Gertrude’s restoration, were on hand to talk about the 1918 built engine and the activities of Exmoor Transport and Exmoor Associates, as were Mike Selby and Jenny Driver. Also attending were representatives of Porthmadog’s Welsh Highland Heritage Railway, Gertrude’s current base, Sarah Westmacott, Gertrude’s owner, and it was also a pleasure to meet David Maidment, the founder of the Railway Children charity, and people who had worked for S&L while Gertrude was in use there, as well as some that had helped the Westmacott family with her early restoration. A complimentary stand acted as a meeting place for former workers of the Bilston Steelworks, where Gertrude served between 1925 and 1959. Part of the Sydenham Ironstone Quarry/Bilston Steelworks double-sided display, which covered about 18 metres, as provided by Andree Hickey, the former Welfare Officer at S&L Bilston, her husband Eddy, both sitting, and Andrew Kennedy of Oakwood Visuals and Steam Days magazine. 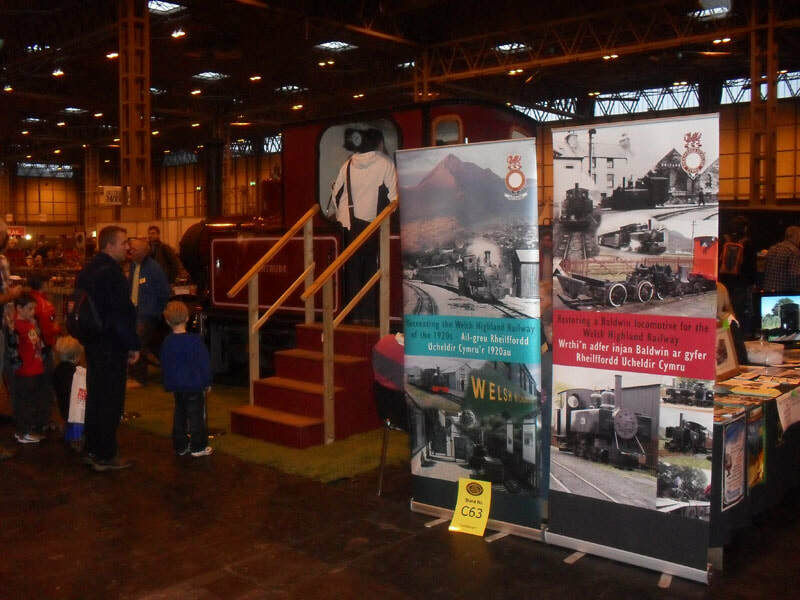 The display boards were supplied by the Welsh Railways Research Circle. On the way to the exhibition it should be noted that with Porthmadog bypass construction work potentially compromising the Gelerts Farm rail to road loading point of the Welsh Highland Heritage Railway, the nearby Ffestiniog & Welsh Highland Railway stepped in to ensure that Gertrude would definitely get to the NEC by taking her across Britannia Crossing and along The Cob in Porthmadog to enable the rail to road trans-shipment to be carried out at Minffordd. Duncan Milner performed the road move, and generously allowed an extra day in his schedule so that Gertrude could visit Bilston for the first time since 1960; our engine was greeted by Lord Bilston, himself a former Stewarts & Lloyds employee, and the Express & Star newspaper attended. The photo-call was at the Springvale Social Club, once part of the Stewarts & Lloyds premises, but now one of just two surviving buildings from the 1979-closed Steelworks. The original ‘S&L’ gates to the former steelworks’ sports ground exist on either side of the Midcounties Co operative owned premises, and we are grateful to all those that allowed us to take this opportunity for Gertrude to relive some of her history. At 4.30pm on the Sunday of the exhibition, Pete Waterman picked out the winners of Gertrude’s Grand Prize Draw, run on behalf of the Railway Children charity – this was appropriate as Pete’s Garrett locomotive was in fact the very first load pulled by Gertrude in preservation, and as our locomotive was withdrawn in 1959, and the first move was in 2009, that was quite a moment! Exmoor Transport are delighted to announce that Gertrude’s appearance at the NATIONAL MODEL RAILWAY EXHIBITION has resulted in £518.20 being raised for the Railway Children (Registered charity 1058991). The total is made up of 501 raffle tickets sold, added to the contents of three Railway Children donation boxes on the engine and on the associated Exmoor Transport display area. This Prize Draw would not have been possible without the generosity of our friends in the railway fraternity, prizes being donated by the WELSH HIGHLAND HERITAGE RAILWAY, ARRIVA TRAINS WALES, JONATHAN CLAY, THE STATFOLD BARN RAILWAY, HORNBY HOBBIES, THE LEIGHTON BUZZARD NARROW GAUGE RAILWAY, STEAM DAYS magazine, and OAKWOOD PRESS & OAKWOOD VISUALS. Thanks are also due to the Warley Model Railway Club and Pete Waterman, and of course to everyone who purchased tickets. On Sunday 13th November steam locomotive Gertrude became the first Gelert’s Farm-based locomotive to travel over F&WHR metals from Pen y Mount Junction to the Cob as she travelled over Britannia Bridge en route from Gelert’s Farm to Boston Lodge. 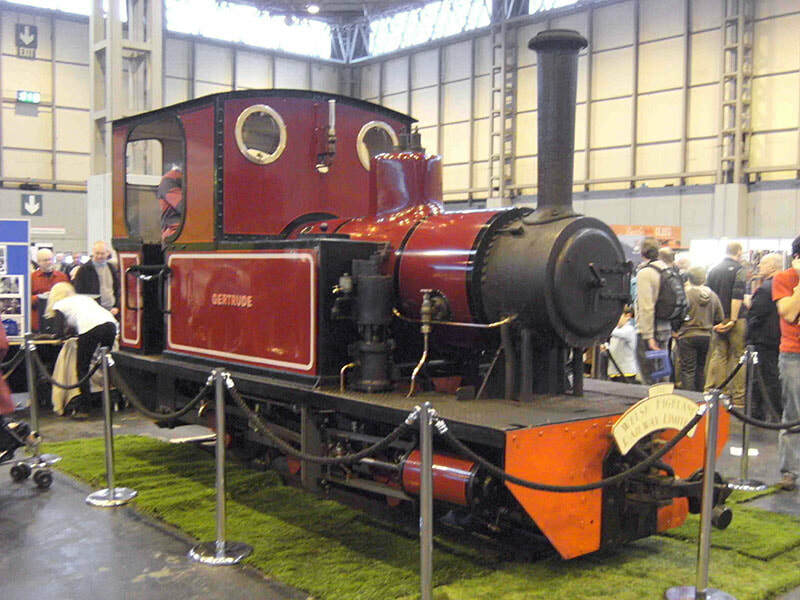 The trip was to facilitate Gertrude’s outward journey to the Warley Model Railway Exhibition at Birmingham’s NEC. WHR Ltd director Richard Harrison was at the helm, as the loco was towed by F&WHR diesel Criccieth Castle, driven by F&WHR General Manager Paul Lewin. Road haulage contractors had expressed concern about how easily a low loader might access Pen y Mount following alterations to the end of Pen y Mount Lane from the new Porthmadog bypass roundabout and rather than risk delays and inconvenience when time was short, WHHR Chairman Martyn Owen asked the F&WHR for assistance. 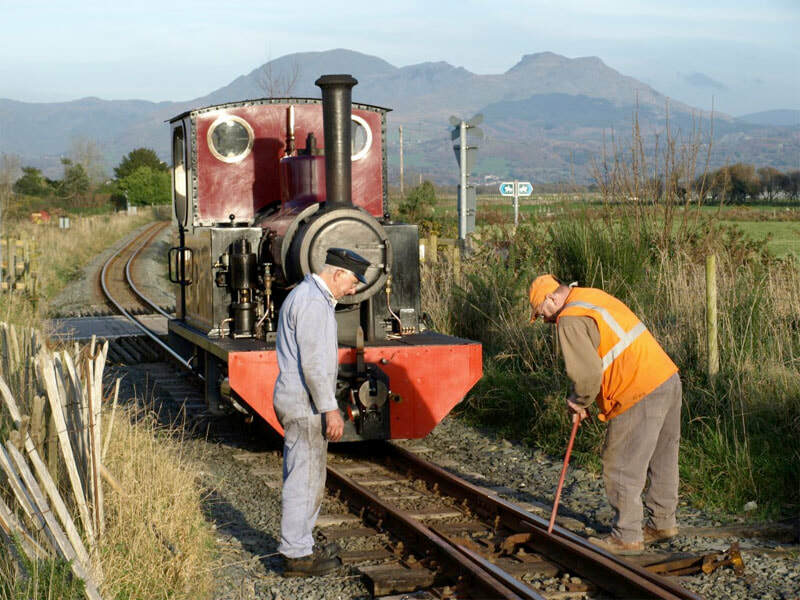 A low loader will collect Gertrude from the Ffestiniog Railway’s Minffordd Yard on Wednesday. Gertrude’s return may be via Pen y Mount Lane when time is not so tight, and highway engineers will be on hand to observe events. 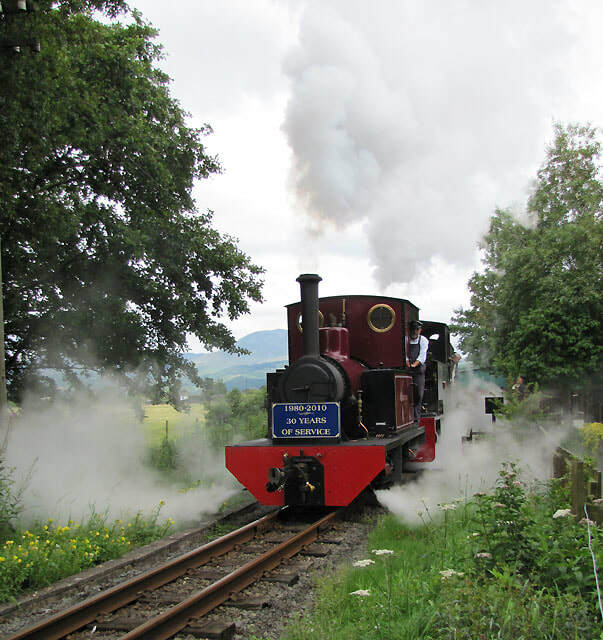 Earlier this year, Gertrude assisted WHHR resident loco Gelert in a series of braking trials on the newly-reopened Welsh Highland Railway. The first Welsh Highland Heritage Railway train has run on the challenging gradients of the Welsh Highland Railway on Saturday June 25, 2011. 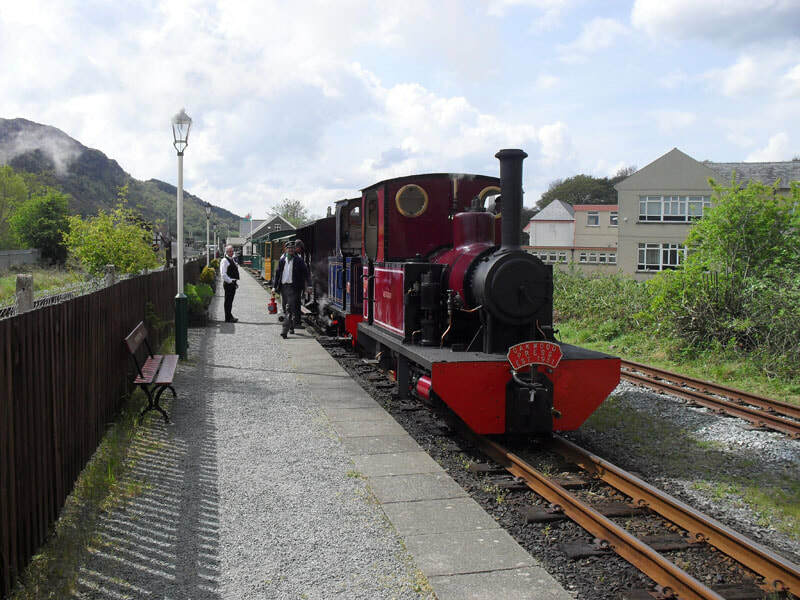 The test train, double headed by WHHR locos Gelert and Gertrude, was run in conjunction with Ffestiniog & Welsh Highland engineers to test braking systems. The WHHR operates air-braked stock, while F&WHR trains are exclusively vacuum-braked. The train left WHHR metals at around 1800 and headed for the foot of Nantmor Bank – the start of the almost continuous 1 in 40 six mile climb to the summit of the line at Rhyd Ddu which makes the WHR the toughest railway in the UK. After the satisfactory completion of brake tests from speeds of up to 20mph to measure stopping distances on the level and on Nantmor Bank, Gelert proceeded through the Aberglaslyn Pass and tunnels to Beddgelert to take water, before returning to Hafod y Llyn to rejoin Gertrude and the train for the run back to Porthmadog, arriving back at around 2230. 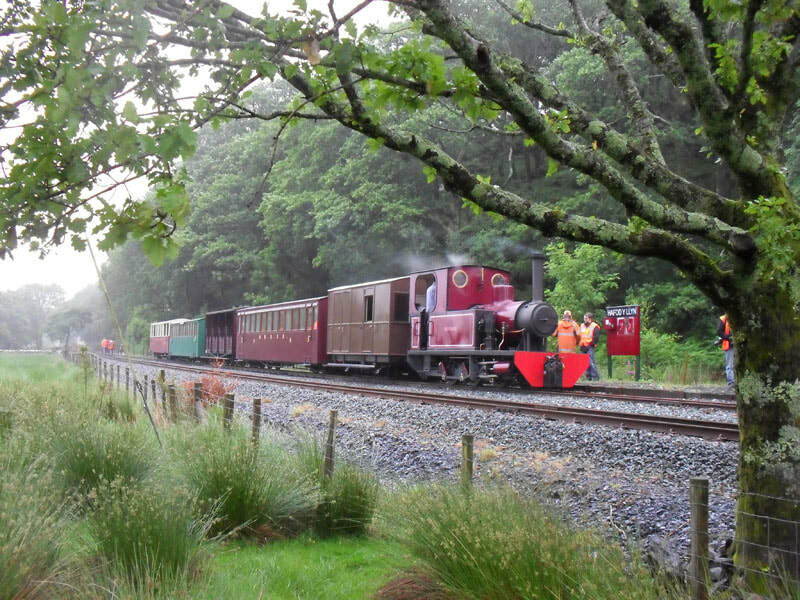 This is the first time a WHHR train has travelled beyond the site of Traeth Mawr Loop – the end of the section of the railway laid by WHHR volunteers as their contribution to the rebuilding of the whole 25 miles of the Welsh Highland. The location is now marked by one of the ‘Tin Tunnel’ accommodation bridges built for farm access. 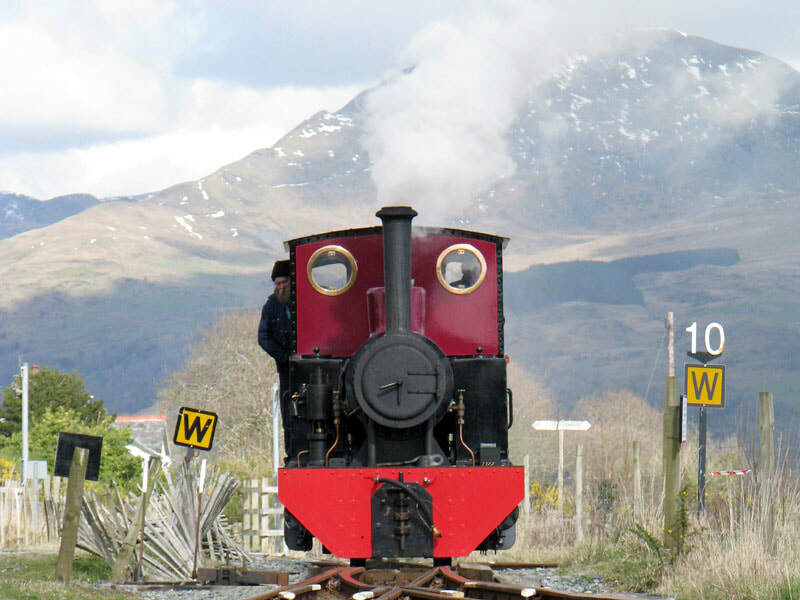 Further tests are planned over the coming months and the next movement from Ffestiniog & Welsh Highland to WHHR metals is likely to be the visit of historic de Winton vertical boiler locomotive Chaloner on its way from Caernarfon to Porthmadog in July. On 2nd August, The Welsh Highland Heritage Railway celebrated its 30th anniversary with a day of special rail services. 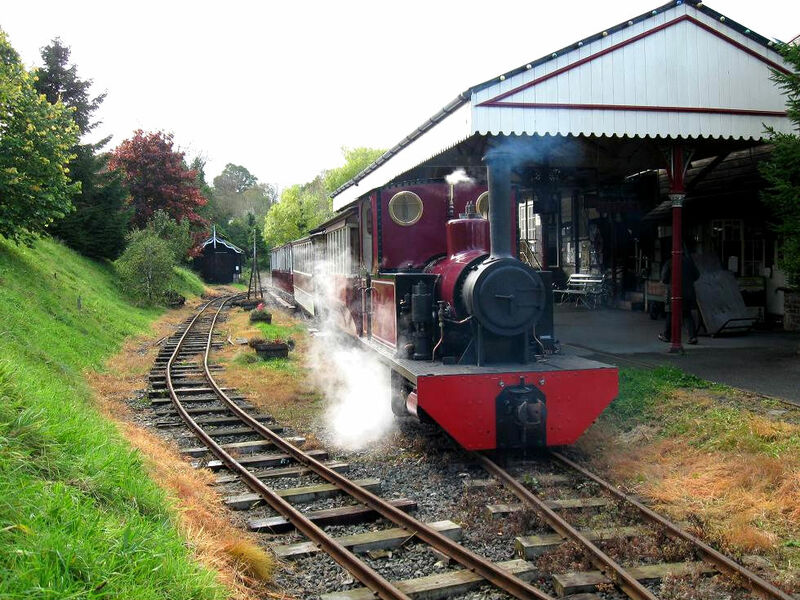 Both Gelert and Gertrude fronted trains for the day. A couple more photos can be found in the photo gallery. A more in depth article can be found on the BBC website. 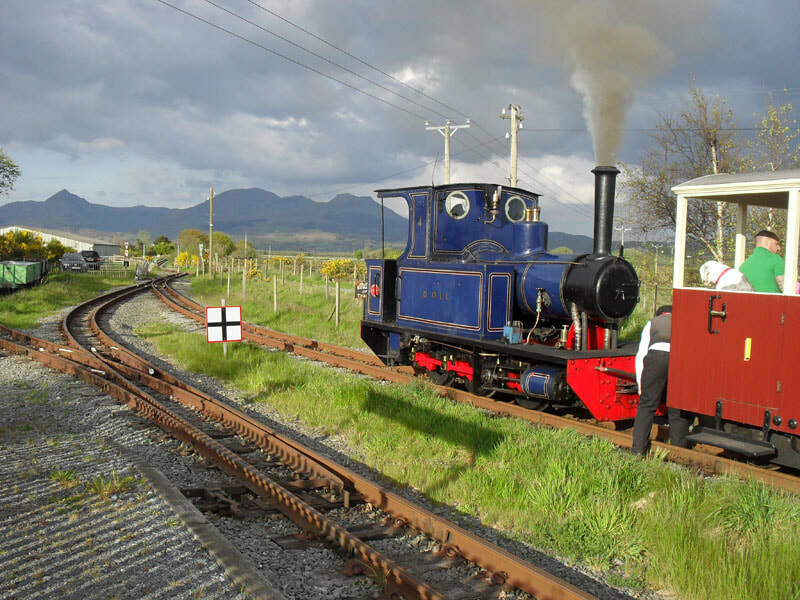 Gertrude arrived at the Welsh Highland Heritage Railway in Porthmadog, just prior to the bank holiday weekend. 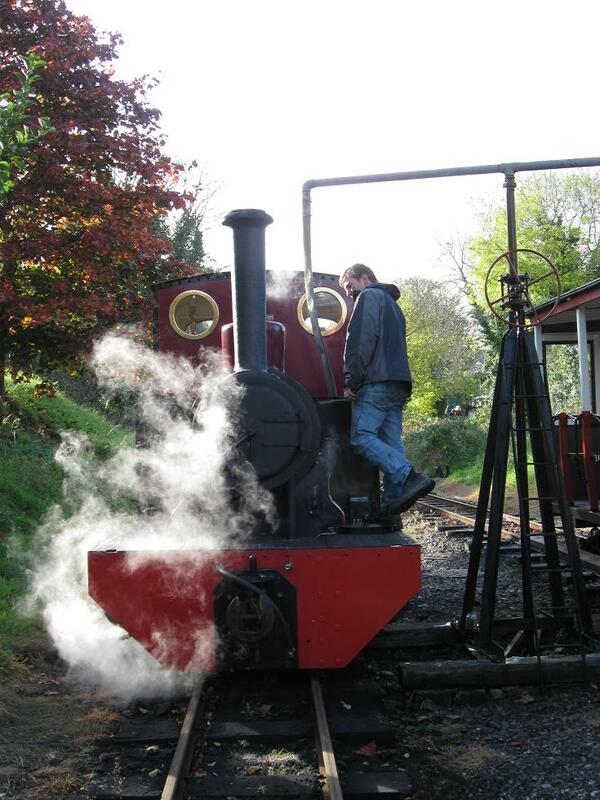 Over Easter the loco was tested ready for entering service. 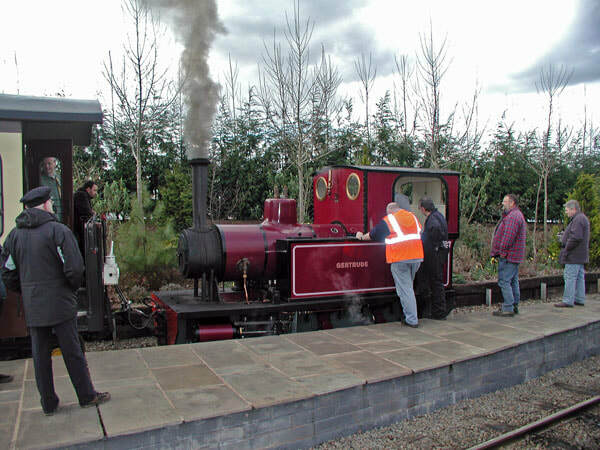 Gertrude will make her debut on WHHR services at the gala event “From Wales To The World” from 1st – 3rd May. More photos can be found in the photo gallery. This weekend saw Gertrude venture further northwards to the spring open day at Statfold Barn Railway. Throughout Saturday the railway was descended upon by enthusiasts and supporters who came to see the first of three charity open days being held on the railway this year. Gertrude excelled herself, hauling some substantial loads around the railway alongside other resident and visiting locomotives. We had the sunroof open for a couple of trips and to see that column of steam shooting into the sky as we made our full regulator charges up the bank into Oak Tree was something else! ​More photos can be found in the photo gallery. Barclay 0-6-0T locomotive Gertrude will be joining the Welsh Highland Heritage Railway fleet from the start of the 2010 operating season. 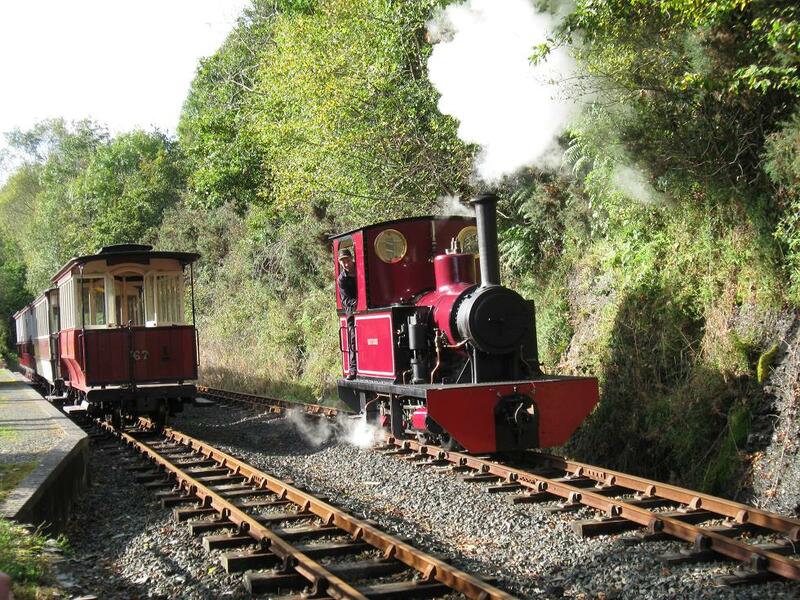 The agreement to bring it to Wales for 2010 will see Gertrude steaming for a minimum of 30 days a year, allowing it to share duties with the WHHR resident Bagnall, Gelert. James Hewett, Chairman of the WHHR, said: “we’re delighted that Gertrude will be joining us for the coming season. We believe she will prove a popular, powerful and attractive locomotive, and add some extra variety to the service. Gertrude is due to arrive in Porthmadog over Easter, and will be steam tested before entering service at the WHHR’s gala weekend on 1st – 3rd May. 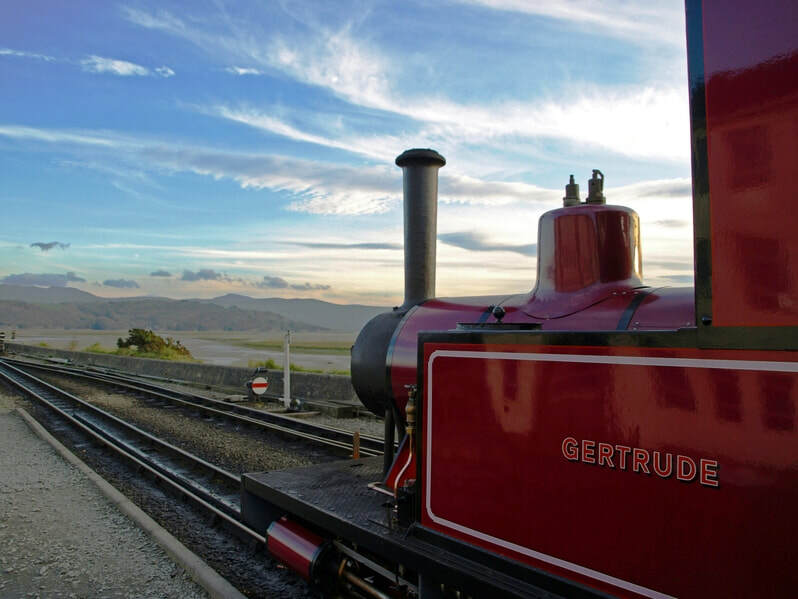 It’s not the first time that Gertrude has had an association with Welsh Highland Railway Limited, the charity that runs the WHHR. The locomotive was destined to come to Wales in the 1970s when the organisation was in its early days. It spent some time at Kinnerley in Shropshire, where the company was based at the time, but never made it to Porthmadog. We would like to thank everyone at Launceston for their support and hospitality. Thank you also to Charlie O’Mahoney from LSR for the photos above and videos below – more photos can also be found on the photo gallery. On Tuesday 8th Sept whilst on route to Toddington for the GWR NG gala, Gertrude stopped for a photo opportunity at the site of Sydenham quarry, near Adderbury, for which she was built (now an industrial estate) the first visit since 1925. The event was covered by the local newspaper – the Banbury Guardian – hopefully some more details of her work there and possibly a photograph or two might emerge from this brief visit. Also at Sydenham were representatives from the Adderbury Local History Group and Bloxham Museum, near Banbury. We are attempting engage the local Banbury press and historical groups in trying to launch a ‘hunt for Gertrude’s relatives’ mission – not the locomotive this time but the living relatives of Gertrude, Doll and Winifred after whom the engines were named. Then the low loader with Gertrude stopped at the garage at Chipping Norton which was owned by Neville Melhuish, the man who picked her up from Bilston, he died about 11 years ago but the business survives and the 1948 purchase he made was wheeled out alongside Gertrude – it was a 1908? Fowler Ploughing Engine – the pair looked fantastic together. Gertrude was in the yard behind the garage between 1960 and at least late 1963 – then it went to an engineering base for the Welsh Highland Railway, at Kinnerley in Shropshire – where of course she passed to Peter Westmacott. Visit the history page for more details. With thanks to Andrew Kennedy for the bulk of this content. 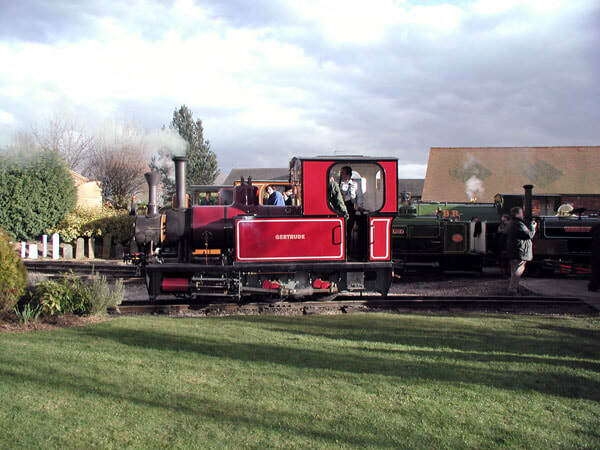 Over the bank holiday weekend, Gertrude was successfully launched in public and worked together with sister locomotive Doll on several trains for the length of the line on the Leighton Buzzard Railway. Following some final finishing touches and tests after arrival on the Friday and Saturday, the locomotive then excelled itself in it’s first weekend in service. On Saturday we were joined by Peter Westmacott along with his daughter Sarah. Sarah joined Gertrude on the footplate for its first train on the Saturday when it did a special return trip to Leedon Loop and back.